Maharashtrian food has been and will be dear to my heart and tummy. Just thinking about any particular dish like Khichadi, Aamti, Rassa I start drooling. You must be wondering why so,,,thats because I am raised in Mumbai and have relished on "N" number of recipes and variations prepared either by my neighbour aunties/grannies or my mom. Soon I will be updating these recipes one by one over here. 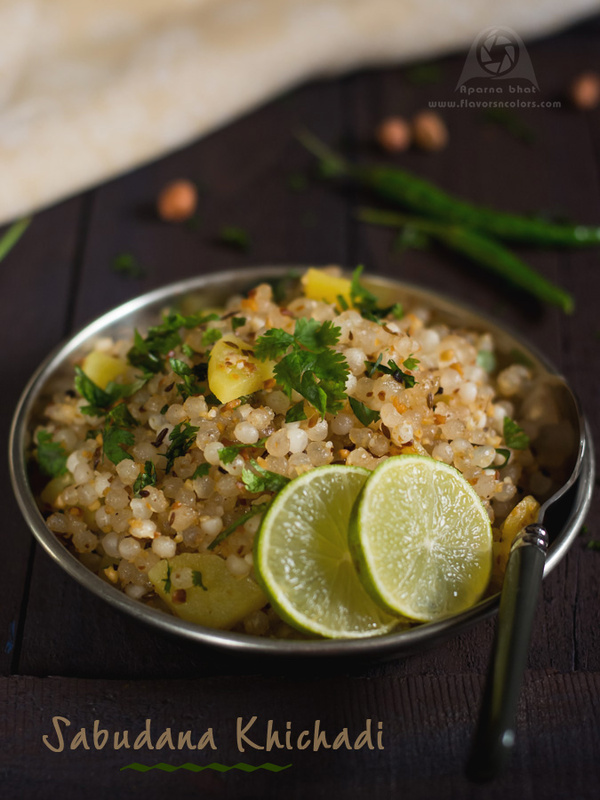 For today, I note down my tried and tested recipe for sabudana khichadi. 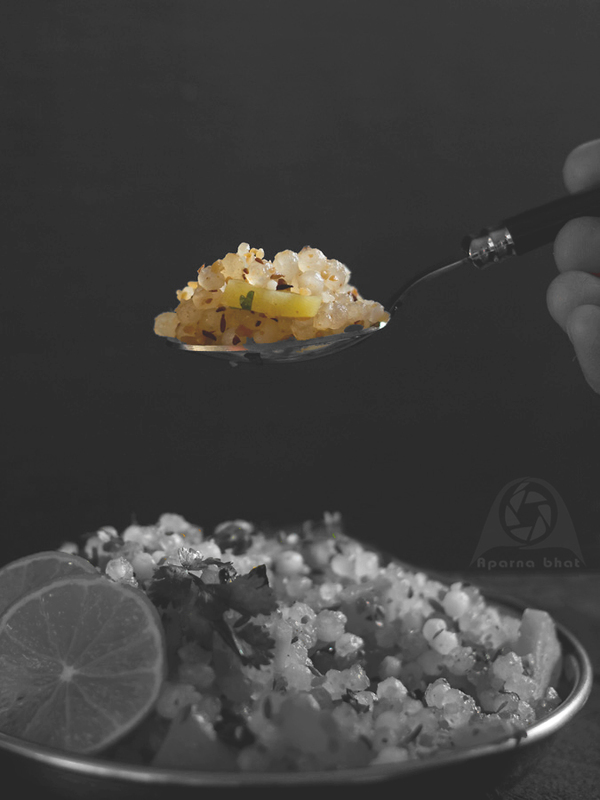 This khichadi is prepared from sabudana /sago pearls/ tapioca pearls. They are light, easy to digest, mainly a starchy food giving a quick boost of energy and hence prepared particularly on fasting days such as thursdays, saturdays, Sankashti chaturthi and Ekadashi. Nutrition wise, sago pearls lacks vitamins and minerals and so this is counter balanced by adding peanuts to the recipe. There are many variations such as adding curry leaves, red chilies in place of green chilies, potatoes, lemon juice, garnish with fresh shredded coconut or eat it with curd to enhance the flavor and make it more tasty. You can try any of these variations to the recipe that's mentioned below. First toss the sabudana in a colander and wash it under the tap. Soak the sabudana with little water (just about to cover the sabudana). After 15 minutes or so drain the remaining water and allow it to stand closed with a lid for 5 -6 hours. Press the pearl in between ur thumb and forefinger. If the center is still hard sprinkle some water and let it stand for some more time. Meanwhile roast the peanuts, deskin them and allow it to cool. Once cool crush few of them and powder the remaining ones in mixie. Combine the crushed/powdered peanuts to the sago pearls and leave this mixture aside. In a pan, heat the ghee on medium flame, toss the cumin seeds and green chillies. Add sliced / diced potatoes and saute them nicely till they get cooked. When the potatoes are done add the sabudana mixture. Reduce the flame to low and stir lightly till they combine well with seasoning. Keep stirring in between, add salt and sugar. Once they are done [ sago pearls become transulcent] garnish with chopped coriander leaves and serve it hot. Chalo now let me relish this before it cools down. Catch u in my next post. Till then HAPPY COOKING !! !